At the age of nine, Harvard Nieman Fellow and award-winning journalist Issac J. Bailey witnessed his eldest brother taken away in handcuffs for murder. In this memoir, Bailey tells the story of the profound impact Moochie’s crime has on his life. 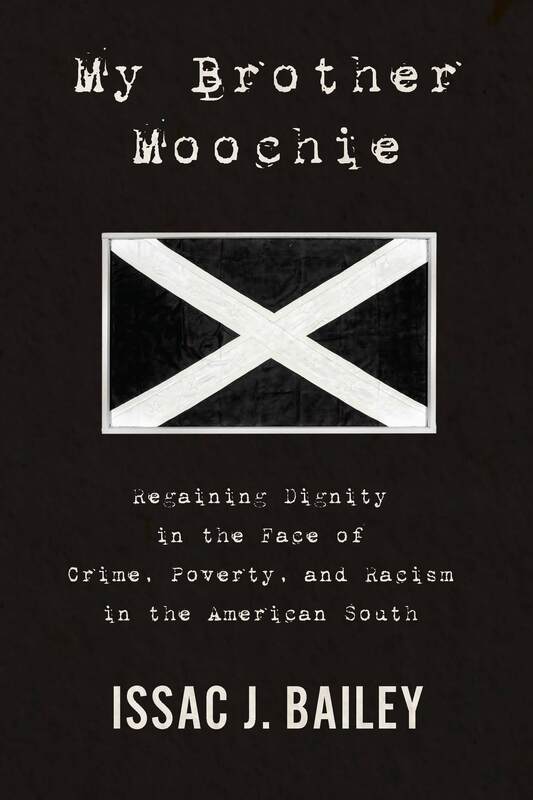 MY BROTHER MOOCHIE: Regaining Dignity in the Face of Crime, Poverty, and Racism in the American South. Available now from Other Press. I decided to tell my wife I had been thinking about killing her. She didn’t run. Years later she said she didn’t process the magnitude of what I was saying, particularly given what she knew about my family’s history. She took it seriously enough to demand I see a psychiatrist, something she had long wanted me to do anyway. She had never been convinced I had fully grappled with the demons of which she was aware. She knew having my hero big brother, Moochie, serve a life sentence for first-degree murder remained a central theme in my life. She knew the emotional and psychological effects of a severe stutter that worsened when Moochie was taken away and had accompanied me into adulthood. I set up an appointment with a psychiatrist recommended through work and scheduled the roughly dozen one-hour sessions around my reporting schedule. I’d spend hours in the morning and early afternoon interviewing the mothers and siblings of young black people (mostly men) who had been shot dead or severely harmed. I’d then steal away for an hour to privately talk to a short white woman about the violence I had witnessed and experienced growing up. That’s the first time someone told me I could be suffering from PTSD. Twenty-five years had passed since my oldest brother, Moochie, had killed a white man named James Bunch. It was the first time in a quarter of a century I was unspooling those memories, or some distorted remnants of them, with another human being. During that process, my psychiatrist became convinced I was a PTSD sufferer, and maybe that’s why even though I was there the night Moochie ran home in bloody clothes, I have never been able to see that night again in my mind’s eye, no matter how hard I try. The diagnosis was a relief, and a burden. Though they never left me, the visions began to subside. Every time I resisted the urge to try to shake them out of my head, they lost potency. My smile became more genuine. I no longer lived in an emotional straitjacket. I started feeling things again, beyond fear, beyond shame, beyond regret. I was happy in a way I had never been. who had murdered and younger brothers who ended up doing awful things as well. I wasn’t the only person in my family who had witnessed what I had, who had lived through the aftermath of a murder and watching a pillar of our household taken away in chains and shackles. The effects of a murder from 1982, and the cumulative effects of other crimes I witnessed while growing up, were still influencing my behavior, darkening my thoughts. What had they been doing to the hearts and minds of my siblings? Had so many of us ended up in prison because of those repercussions? I didn’t know if any of them had been suffering PTSD, too (most people exposed to the violence I was aren’t later diagnosed with the disorder), didn’t know in what other form the ripple effects were showing up in their heads, if at all. All I knew was that if it could grab hold of me and not let go for twenty-five years, it could have done the same to them. That realization helped me square the circle that is my knowledge of them, smart, engaging, compassionate men I knew would sacrifice themselves to protect me and others they loved but who, nonetheless, committed horrifically stupid and even evil acts against others.